Researchers at UCLA are warning people that an underground drug called “poppers”, which was made popular in the 1990’s, now has ingredients like household glues, aerosols, and other ewwy crap our fabulous bodies is not meant to consume. There is also a new possible side effect called “sudden sniffing death” doctors won’t be able to diagnose until it’s too late to treat. Gay men can easily be introduced to these products by sexual partners without being aware of the dangers, and physicians also need to understand the dangers and alert their patients, according to a research team led by Dr. Timothy Hall of the University of California, Los Angeles. Doctors “are taught almost nothing about regular nitrite poppers,” Hall said in a news release. “They’re little more than a footnote at the back of most addiction textbooks, lumped in with sniffing glue and huffing aerosols, even though the physiologic effects are quite different. Yes you’re grown and looking to have a little fun; but don’t let that 15 seconds turn into drowning in medical bills or take your life. Proceed with caution. 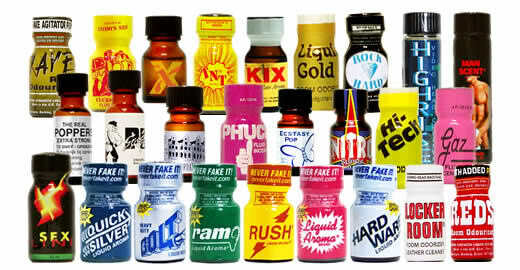 Have you ever used poppers? Describe your experience in the comments below. We use to call it locker room way back in the day. I used it a few times and went crazy each time. A friend of mine died from using this poison. Young people stay away from this. If you want to live a long rich and beautiful life stay away from this killer drug. I have seen the devastation that it does to your beautiful temple.